A floral heart of ruffled Peony and White Lily with sheer hints of fresh Grapefruit and Orange. A fresh air impression infused with leafy green notes surrounded by a hint of cool, mossy forest paths. 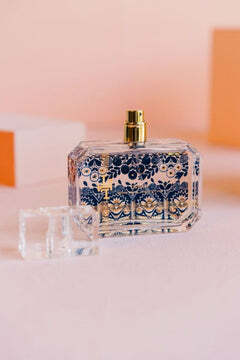 The Lollia signature fragrance. Light as a breeze fluttering over soft organza. Lush floral infusions of Peony & White Lily are at play with Lavender and Violet, creating a fresh fragrance that will become your everyday favorite. A luxurious botanical handcreme with rich Shea Butter and Macadamia Nut Oils to nourish hands. Each fine detail is thoughtfully presented to make this an aesthetic treasure outside and inside..